Outline: Story of the healing of the centurion's son. Rest of script is paraphrased Scripture verses on believing, eternal lie, God's mercy, salvation by faith. One day Jesus went back to a town in Galilee named Cana where He had done a miracle. There was in Capernaum a chief. His son was sick. 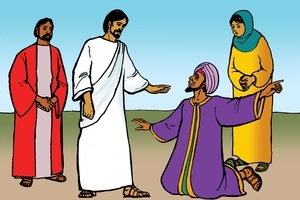 When the chief heard that Jesus had arrived in Cana, he went where Jesus was and begged Jesus to come to his town and heal his son. His son was about to die. But Jesus said to him: "If you do not see signs and miracles, you do not believe." The chief said to Jesus: "You, Lord, come to my house before my son dies." Jesus said to him: "Go. Your son is living. He is well." The man believed the word of Jesus and went home. When the chief arrived near his house, his servants met him in the road and said to him, "Your son is living!" Then the father questioned them, "What hour did my son begin to get well?" They said, "Yesterday at seven o'clock the fever left him." Right away the father understood that it was the same hour that Jesus had said, "Your son is living." The chief with all the people in his house believed on Jesus. He put away his idols and put his trust only in Christ Jesus. He who believes on the Son of God has eternal life, and he who does not believe on the Son shall not see a glimpse of life, but the anger of God shall stay over him. Jesus said, "I am the resurrection and the life. All that believe in Me, though they were dead, shall live. And he that believes in Me, shall never die." Those who have not the Son of God shall not live forever. There is no salvation in anyone else, for there is no other name under heaven given to the people whereby we shall be saved. You know that you are not bought with destructible things like silver or gold, but you are bought with the rich blood of Christ, like a lamb without spot or blemish. Not because of the good things which we have done, but because of the mercy of God He has saved us. Because of that which God gives we are saved through believing in Him. And this is not of us. This is what God gives, not because of works, so that no one can make himself great. Receive Jesus into your heart. Ask Jesus to take away your sins. Ask Jesus to be your own God. He is the only God. When you have Jesus, you have eternal life also.